The Miami Beach hotel sector is experiencing a strong resurgence since the recession, but several industry experts say the market still has ample room to grow. Hotel developer Robert Finvarb and Hersha Hospitality Trust executive Robert Hazard discussed the upside of the Miami Beach hotel market during a panel discussion at Wednesday’s Marcus & Millichap’s Commercial Real Estate Forum: Florida, held at Florida International University’s North Miami campus. South Florida real estate veteran Seth Gadinsky and Kimpton Hotels executive Tom Riley also participated in the panel, which was moderated by Lifestyle Media Group editor-in-chief Kevin Gale. The pace of growth in the city’s hotel sector is currently 4-to-5 percent ahead of Manhattan, according to Hazard, senior vice president of acquisitions and development at Hersha. Hazard’s company owns the Courtyard Miami Beach Oceanfront hotel. Yet the South Beach area of the city needs a “dose of reality” when it comes to room rates, Hazard said. Momentum in the city’s hotel market has shifted in favor of the mid-Beach section, where developer Alan Faena is working on the massive Faena Miami Beach mixed-use project that spans several blocks along Collins Avenue. Finvarb, who is currently developing the AC Hotel by Marriott near the Faena site, noted even traditional hotel operators like Marriott are trying to capitalize on the area’s edginess. Marriott is partnering with developer Ian Schrager on Edition Miami Beach, the first United States version of the brand. One sector trend to monitor is the transition from local to “more sophisticated” hotel operators in the city, according to Gadinsky. H3 Hospitality partner Seth Gadinsky tells us that “value enhancement for hotels is a constant goal–they need to keep up with competition as fresh new hotel brands appear on the market monthly.” It’s critical to keep up with the industry’s changing trends, to develop unique food and beverage concepts or retail offerings, and to bolster a hotel’s assets. (Might we suggest having an in-hotel magic shop?) Recently Seth, who owns Gadinsky Real Estate, formed H3 along with colleague Justin Schultz and nightclub developers Cal Fortis and Ken Barilich to specialize in adding that missing zing. Enrique Iglesias and Rafael Nadal can really draw a crowd. 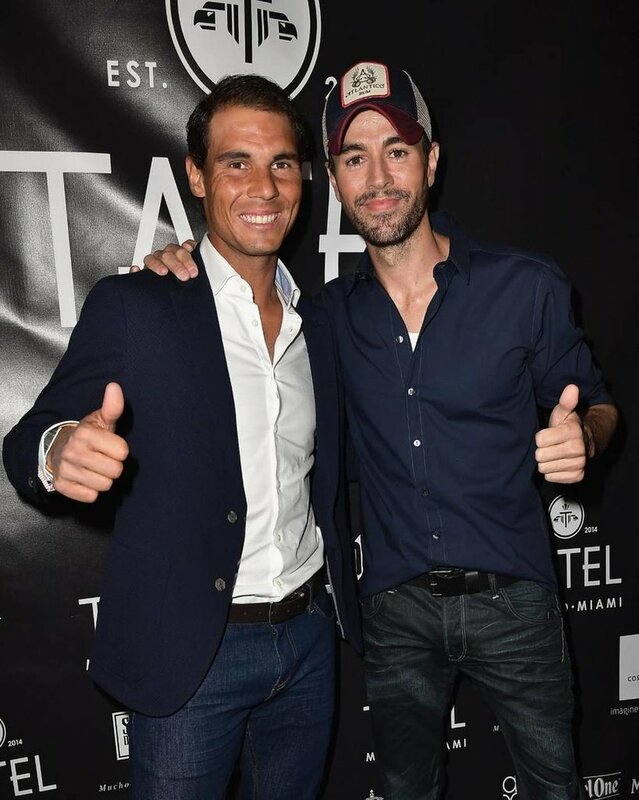 On Monday night, the pop singer and tennis star attended a blowout party to celebrate the opening of their restaurant, Tatel Miami, a sister to the Madrid eatery. Iglesias said he was “proud” to bring Tatel to Miami, where he resides with longtime partner Anna Kournikova. It officially opens 5:30 p.m. for dinner Tuesday; a location in Ibiza is next, according to the website, TatelRestaurants.com. Seth Gadinsky and Justin Schultz of Gadinsky Real Estate and legendary nightclub developers Cal Fortis and Ken Barilich — of With Smith — announce the launch of their new collaboration:H3 Hospitality. The full service company will offer real estate, design, and operating services to hotels, restaurants, nightclubs and family entertainment properties. The idea for the company came about when the four partners collaborated on a hotel project and realized that no other company in South Florida has the experience to provide all of these professional services to the hospitality industry. he Greater Miami & The Beaches Hotel Association hosted a panel at 1 Hotel & Homes South Beach this week, which included executives from PricewaterhouseCoopers and Robert Finvarb Companies. The panel, How to Entice Guests and Drive Revenue, discussed challenges and solutions to building hotel brand appeal and revenue. PwC’s Jonas Niermann moderated the panel, which included panelists Seth Gadinsky, co-founder of H3 Hospitality and owner of Gadinsky Real Estate; Borja Alvarez de Estrada, brand franchisee of Purobeach; Liubasha Rose, VP of design at Starwood Capital; and Brian Vujnovic, VP and director of operations at Robert Finvarb Companies. Purobeach, a luxury beach club with locations from Portugal to Dubai, told The Real Deal that the company is scouting sites in Miami-Dade, with plans to open two hotel locations. “We are excited to expand to Miami Beach,” says Waits. “It’s a capital of nightlife worldwide and we look forward to bringing our vision to the city,” says McCormack. Located on iconic Collins Ave. and beside the boutique Boulan Hotel, Adore will be Miami Beach’s first venue to open doors in nearly a decade. Inspired by a forgotten cathedral’s fall from grace, Adore features a decadent candle bar with engraved antique mirrors downstairs with a darker hanging chain bar to refresh mezzanine level guests. The deep reds and glowing ambers create an atmosphere that is both sweet and sinful, where guests can explore the intimately hidden corners of the venue. Luxurious booths circle the dance floor, while a glowing cathedral ceiling floats above the stage and DJ. In addition to the nightclub’s plush decor, the 12,000-square-foot space will also be equipped with the finest sound and lighting systems in the city. Adore will feature the most elite sound system in Miami using the latest line by Funktion-One, the industry leader of premier nightclub audio systems. With over 100,000 watts of hi-fidelity power, clients and artists can expect an enhanced nightclub experience unparalleled by other venues. Setting new standards in nightclub technology, SJ Lighting has created a lighting and video design that raises the bar for world-class clubbing. Partygoers will vibe to the DJ’s tempo late into the morning hours under a custom three-dimensional LED sphere, propelling the disco ball concept into the 21st century. While facing the DJ booth, guests will discover a floor to ceiling LED display showcasing video imagery and effects that are fully integrated into the control systems. Expect the imagery, color and effects to flow together seamlessly with the music and atmosphere of the night. Adore’s control system is considered the industry standard throughout the professional lighting community, having been implemented at esteemed events including EDM festivals, the Olympics and the Super Bowl. Created by The Ocean First Group, Adore is owned by leading hospitality entrepreneurs and renowned nightlife moguls, Cy Waits and Cory McCormack. Adore Nightclub will be located at 2000 Collins Avenue, Miami Beach, FL, 33139. Operating hours will be Thursday through Sunday evening from 10:30 p.m. until 5 a.m. For additional information, please visitwww.ClubAdore.com . Four men with backgrounds in retail, real estate and marketing have teamed to transform South Florida’s nightlife. Ken Barilich, Seth Gadinsky, Cal Fortis and Justin Schultz recently formed H3 Hospitality with a goal of providing solutions for hotels to activate every square inch of their property to stay profitable. SFBJ: Are there any design trends that are particularly popular for hotels? Barilich: The best hotels aren’t just hotels, they’re incubators for the next great trends in food, interior design, architecture and wellness. One of the trends is “more fluidity,” with less definition between the public spaces of the hotel. The definitions of rooms, lobbies, bars, restaurants and other public spaces are blurring. There is also a return to good taste for hotels. We are seeing some hotels move away from young and trendy with fewer gimmicks and, instead, they are offering more value for the guest’s money. Gadinsky: Hotels and their restaurants are also becoming more seamless with the surrounding community. There is now less of a distinction between a hotel restaurant and a neighborhood hangout, with locals, and not just hotel guests, spending time there. SFBJ: What can hotels do to provide quality, entertaining public space on a tight budget? Gadinsky: A return to taste vs. gimmicks can be a cost-effective move for hotels. For example, doing away with lavish room service or bell stations in the lobby. This opens up room for the lobby to be utilized with kiosks for food, coffee and liquor service, and gives guests more value for their money. Hotels are becoming more inclusive and inviting in the outside world, rather than just guests staying on property. Many lobbies now provide comfortable workspace, accessible power and Wi-Fi access, food service and indoor-outdoor aesthetics, making them a draw for guests and the community. SFBJ: Why does Miami Beach’s nightlife, retail and restaurant scene need a refresh? Barilich: Miami’s nightlife, retail and restaurant scene has changed dramatically over the past decade. The influx of great outside hoteliers that understand the entertainment business … has elevated the market for hotels as entertainment options. Miami has become a “fish bowl” city … where people come and look to see what the latest trends are for the entertainment industry. Who We Are: This page allows you to get to know the team and the expertise they bring to the table. It is the variety and multitude of experience that each person brings to the table that makes H3 such a unique partner for all of your nightlife, retail, family entertainment, and food & beverage needs. Projects: Here you will find a sample of projects that the H3 partner companies have already completed. This page will change the most as new projects featuring galleries highlighting construction progress and completed designs are added. Services: With the variety of experience that comes with the H3 team, we thought it would be helpful to tell you about the type of services we can offer you. This list is just a sampling of the many ways we can help you reach your goals. Blog: Whether it is through our Blog, Twitter updates, Facebook posts, Instagram pictures, or any of the various social media outlets, let this page be your go-to source for updates on H3, our perspective on the hospitality industry, and anything we feel like sharing with you. We recommend you bookmark this page before our home page and check it often. Contact Us: If you feel like reaching out to us for any reason, use our contact page to send us an e-mail, call us, or get directions to our office. We would love to sit down with you and discuss how H3 help maximize a hospitality space. Thank you again for visiting our new online home. We look forward to working with you! If you would like to reach out to us, please e-mail info@h3hospitality.com.